In my last post, I shared about my Large Family Meal Planning System. My homemade meal planning system goes hand in hand with my large family grocery shopping. Once I had a solid plan in place, I needed to keep my pantry well stocked and in order. I remember the days when just getting 5 kids strapped into car seats in my tiny Ford Windstar was an Olympic Event. I was lucky that I came home with all my faculties let alone with all the groceries I needed to make it through my menu. Thankfully I had honed my Tetris skills in high school and was able to use them to load the piles of groceries and other compulsive purchases in and around my children’s feet. Unfortunately, all that effort ended in my returning to the store for that stick of butter or jar of peanut butter I forgot along with being consistently over budget. As the children grew, so did our little Ford into a Giant 12 Passenger Van. Our large family grocery budget got tighter and tighter while the trips to the grocery store for items we missed or ran out of too early became more frequent. Necessity is the mother of invention, and so to save time, money, and my sanity; I came up with a system for Large Family Grocery Shopping that works well for our family and keeps our pantry well stocked. 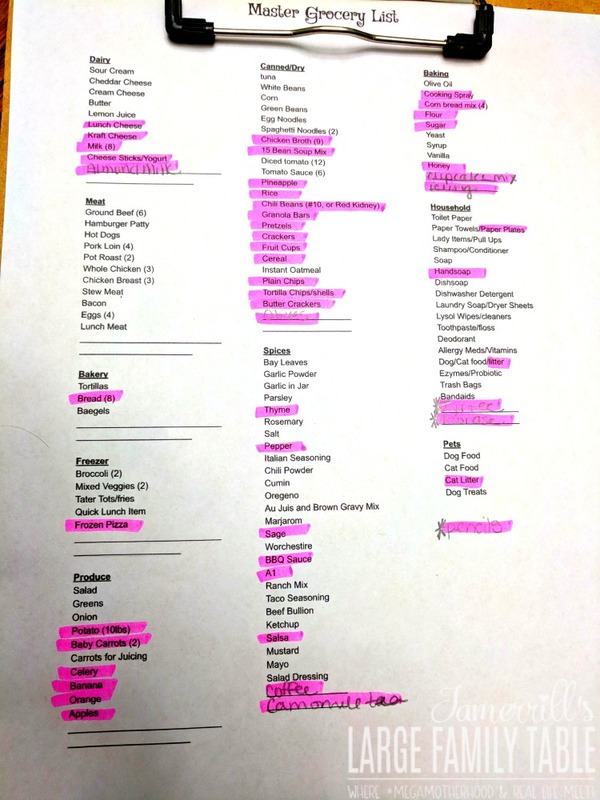 First, with my Master Grocery List and a clipboard, I use a highlighter to mark any items I’m running low on or am out of. It helps to keep my pantry, refrigerator, and freezers well ordered. Let’s be honest, sometimes that just means all like items are in the same pile on the shelf. No Pinterest perfect pantry here. 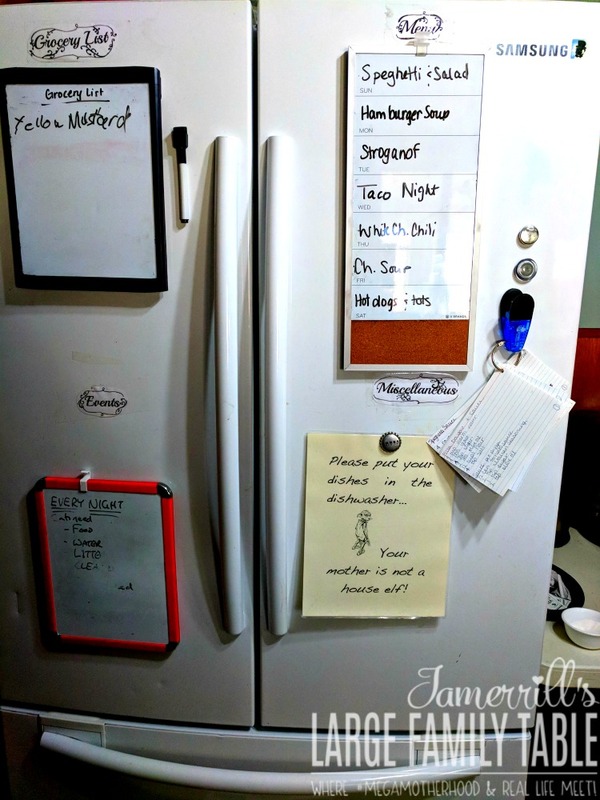 When I’ve inventoried my food storage areas, I check a whiteboard we have on the front of our refrigerator specifically for grocery lists. The children know when they use something up, be it toothpaste or fruit snacks, to write the item on the Grocery Whiteboard. They can also make requests for specific items like socks or a new toothbrush. The next thing I do is Check my Google Calendar and homeschool planner. I add any unusual items we may need for school or a special event to my Master Grocery List. Finally, I check my Weekly Grocery Ads. Every Wednesday, my grocery stores send me ads in the mail. As soon as they come into the house, I skim them quickly, jotting down in a spiral notebook any items I should stock up on. I try to include the store, price per unit, and any information. This serves as my Price Book as well. I can check and see what sales have been in weeks passed. Usually, sales come back around in 6-8 weeks, so I can easily calculate how much of an item I need when its a good deal. I also jot down notes on which stores have the best regular price on frequently purchased items. 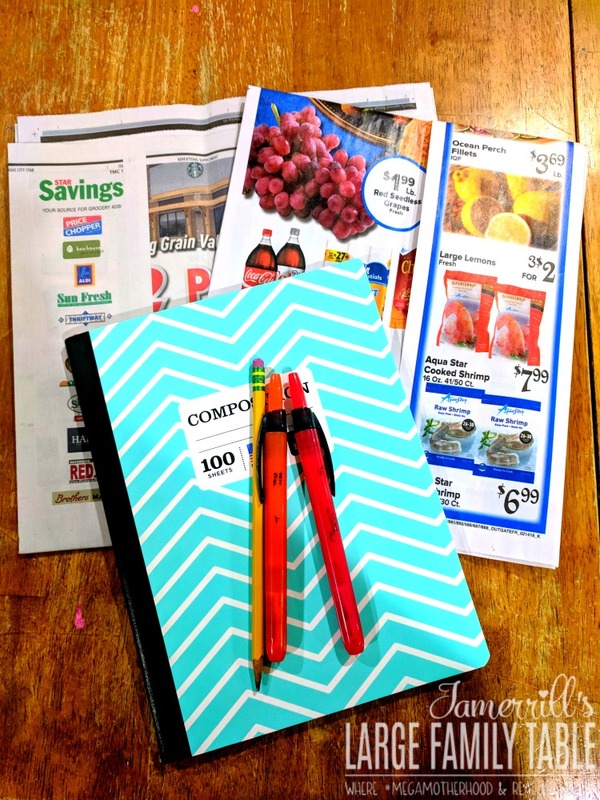 On grocery day, I pull out that spiral notebook and add any of those stock up items to My Master Grocery List. 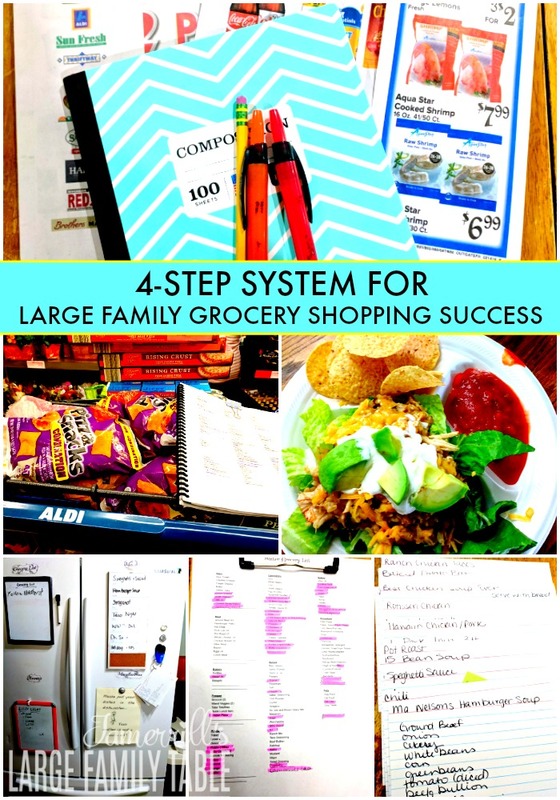 The more I have used this 4 step system for Large Family Grocery Shopping, the more it has become a habit. Not only has it reduced decision fatigue, but also our trips back to the store. After a while, the list practically writes itself! I am able to save money by stocking up on sale items, frequenting the stores with the best deals, and reducing compulsive spending. These tips could even be adapted for use with a grocery service! Spending less time grocery planning means I have more time (and energy) to spend with my family, and that is the best savings off of all. Vicki Williams is a homeschooling mom of 7 who enjoys sharing her large family meal planning and grocery shopping tips with other moms who get it! You can find Vicki here on Instagram. Great ideas! These are really helpful. I’m a Virginia mom of 10 (9 boys)! They eat everything in the house and I’ve spent years trying various meal planning techniques. I loves the master list idea. So simple, but very helpful! I don’t have a large family. It’s just me and my two girls but I will be sure to adapt your tips that will also apply to me and save time and money. Thank you! 1. Do you shop all the stores with good deals then? Or do you use anything like Walmart Savings Catcher (since they discontinued price matching)? 2. How often do you shop for your family- weekly or less often? Stefanie – family of almost 7 ?